Do you feel like your home needs more natural light? Perhaps you want a more expansive view, and a better connection with the outdoors. Our picture windows can provide you all that and more. 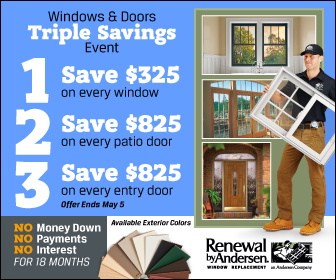 Renewal by Andersen® of St. Louis explains the benefits of our picture windows. With our picture window’s maximized glass surface, plenty of natural light can shine through. Sunlight brings out the true color of your interior décor, helps reduce stress, improves your mood, and enhances your productivity. It can also help save you money by reducing your use of electric lights. You won’t have to worry about the sun’s heat, as well. Our special High-Performance™ Low-E4® glass reflects most of the sun’s heat away and blocks 84% of harmful UV rays. This means you can enjoy the sun without the drawbacks. In addition, our glass is 56% more energy-efficient in summer, and 45% more energy-efficient in winter compared with regular dual-pane glass. Depending on your location and climate, our glass solutions can help cut your utility bills by up to 25%. Our picture windows can help your home stay cool, comfortable, and bright this summer. Another benefit of our picture window’s large glass area is a stunning view. Our picture windows can be custom-sized; if you want floor to ceiling view of your surroundings, then we’re the Chesterfield, Missouri windows company for the job. This large vista is possible because our windows are made of Fibrex, a composite material with the low-maintenance of vinyl with the strength of wood. This means our window frames are strong and can support large panes of glass even with thinner frames. You’ll get a clear and wide view of the outside all from the comfort of your home. If you have a unique home in Chesterfield, doors with distinctive designs, complex architecture, and strange window styles for example, then picture windows are perfect for you. Aside from being able to fit any opening, our picture window can be combined with many different window types. Bring together our picture windows with specialty windows of all shapes and sizes to create a striking look, or combine it with some casements for some ventilation. With 47 exterior/interior color combinations, and a varied selection of grille patterns and hardware, the design possibilities are endless. We are dedicated to providing you with a hassle-free window replacement experience. Our lines are always open and your needs and concerns are our foremost priority. The staff at Renewal by Andersen of St. Louis is courteous, professional, and skilled. Your window replacement will get done on time, and without any problems. Give us a call to learn more about the benefits of our picture window, or about our other products and services. We also offer a free estimate.